Social Media became in the last couple years more and more important also in regards of promoting your business online. With so many platforms to choose from it is understandable that especially newcomers can feel a little overwhelmed. Today we would like to post a few general questions business owners often have and answer them. Why should I use Social Media to promote my business? There are many reasons to use social media to promote your organization. One very important is transparency. This may sound wired but this is actually one of the most important reasons especially for new businesses. Just imagine you find a product on a website you have never heard of, provided by a company you don’t know. Would you give them your address and credit card details without hesitation? Now imagine you find the same company on Facebook and see that they have a lot of fans plus a lot of great reviews. It is now so much easier to trust them. If the same company has not only Facebook, but also Twitter, YouTube and some other accounts were they are actively post and interact with their audience you will feel much more comfortable to use their website. Another reason for using Social Media is feedback. As soon as you have build an audience you can ask them for feedback. For example: You have a bakery and your blueberry muffins are the best. Now you feel it is time to introduce muffins with a different flavour, but before you go and buy the ingredients you can ask your customers if they would like to buy them. And later you can even ask them how they liked them. Should I use every single platform? Well, it doesn’t hurt if you secure an account with the mayor platforms, just in case you want to use them later. However, if you don’t use a platform frequently you shouldn’t mention it on your website nor encouraging people to follow you when you know you won’t use it. General speaking you may want to have a Blog and a Facebook Page, even if you are a B2B business, a LinkedIn Page might also be a good idea. We know some business owners who really like using Twitter, while others don’t know how. Google Plus and YouTube are also great platforms and there are of course various location based services such as Foursquare and Yelp you want to check out, especially if you are a restaurant or pub owner. Depending on the nature of your business you may want to plan which platform to concentrate on and which you can keep for later. In our free consultations we help you to figure out which one might be best for you. This is not easy to answer. Some business owners love to use social media and to update their audience while others prefer to leave it to an expert. In our consultation we often bring up the example of using an accountant or doing accounting on your own. Some may find it easy and do not want to use an accountant while others prefer to have one. It is up to you what you feel is best. How much does it cost to have an agency managing my social media needs? It largely depends on the kind of platforms you want to use, the amount of updates you would like to provide to your audience and also how many platforms the agency has to manage for you. Another factor is if you need someone for setting up the account as well as your goals. 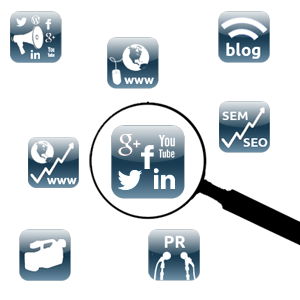 Many of our clients like to combine related services such as Social Media Management and Social Media Advertisement. All our packages are tailor made, this is why we offer free consultations to get to know you, your goals, your needs as well as budget. We also offer flexible packages so you can increase, decrease or even pause our services depending on your current situation. To learn more about us feel free to follow the links below. This entry was posted in Promoting your business online and tagged 2015, advertising, blog, blogging, Facebook, foursquare, google plus, internet marketing, marketing, online advertisement, online marketing, social media advertisement, social media management, social media marketing, social-media, twitter, yelp, youtube. Before we all go into our well deserved Holiday Mode we would like to encourage you to take a moment to read this post with our opinion on the topic Social Media in 2014. If you follow the changes some platforms made or announced in 2013 you can maybe already guess what will become important for your business in 2014. But for those who are not following every single announcement or like to hear what we think, please read on to see our prediction for 2014. Let us start with online videos. We think this will play a much more important role in 2014. Some social media experts pointed already last year out that 2013 is the year where you need to start a YouTube Channel and we think everyone who did will have an advantage in 2014. Not necessarily because of subscribers but because they already know what works for their business and what not. How much they need to invest in 2014 and how often they need to produce videos to keep their audience entertained and informed. When talking about videos we need to talk about video advertisement too. Video ads will also become more important in 2014. But we think you should be careful because video ads can also become an annoying factor in 2014. You may have seen the announcement from Facebook regarding video ads in their newsfeed. We are sceptical and would like you to imagine the following to understand why we are not sure that this is a good idea. Imagine you login to your Facebook account and suddenly hundreds of video ads play their message at the same time. Well, even one or two at the same time will be annoying don’t you think? Now imagine your target group will get your video message on Facebook and the reaction might be that they are annoyed by it and do not buy your product or ask for your service just because of an automatically played video ad on Facebook. Since we are on the topic. Did you noticed that the Rating System on your company Facebook Page is now much more visible? The rating system was implemented a while ago and is around for some time now, but was never really a big part of a company Facebook Page until recently. Now the problem is, and we know that as a fact, if you have only a few followers and even fewer rate your site just one bad rating and you end up with a low overall score. Bigger companies with many ratings may not need to concern themselves with this, but small business owner should. Because one bad rating and you suddenly have to deal with a two star overall rating and this can become a problem to encourage new customers to try your product and services. We hope that our post gave you a few ideas what to do in 2014 with your Social Media and Online Marketing Strategy and Budget. What do you think will become important and to watch out for in 2014? Leave a comment below and we wish everyone a Great Holliday Season. This entry was posted in Social Media and tagged 2013, 2014, advertising, business, Facebook, google, google plus, internet, internet marketing, internet marketing solutions, marketing, online advertisement, online marketing, public relations, social-media, video, video ad, video advertisment, video marketing, video production, website, youtube, youtube video, YouTubers. Promoting your product and services can be challenging. For many small businesses and startups the internet seems to be a good and cheap way to do advertising. But before investing a lot of money in the wrong platform, you should know a bit more about the many different ways to promote your business, product and services online. Often a combination of more than one platform leads to a higher success than just putting everything into one online advertisement campaign. Our weekend seminar is designed to help you to find out which platform is the best for your business. We will talk about Online Marketing in general and also talk about Social Media integration into your Online Marketing campaign. To secure that you will get the most out of our seminar we keep our groups small, only a max of 10 participant per weekend. We also decided to offer this amazing two day seminar for a very discounted price. Only $129.00 for two full days. We will talk about Online Marketing in general. Mention the most popular platforms to promote your business, products, services or events online. Plus talk about possible combinations. You may have heard a lot about those two. SEO stands for Search Engine Optimization and SEM for Search Engine Marketing, but what does it mean? We hope we can help to get a bit more light on this subject for you in our seminar. In our experience Blogging is especially for small businesses a great way to inform customers about your business, products, services, special offers and events. A Blog can be a very powerful tool to help you reaching your goals, even with a very low budget. To help your customers finding your Blog or website you will need to add keywords so that your site pops up when someone uses a search engine. Let us guide you a little by explaining how important Keywords and Tags are. Our second day is all about Social Media. We will start with a little introduction and we will also combine things we learned the day before into this topic. What is the difference between a Facebook Profile, a Facebook Page and a Facebook Group? How can you integrate them into your Online Marketing Strategy and more important should you? Telling a storey with only 140 characters is not easy. Is Twitter really the right platform for you? Or is it just a waste of time? Let us help you to find out. We like to call it the professional Social Media Platform. You can find here professionals from around the world, but can also use it to introduce not just yourself, but your business, products and services. The Social Media Platform from Google. Some love it, some like it, some think it is not worse spending time and money on it. We would like to introduce it to you and maybe you will be surprised that you can find your audience here. Videos are a great way to introduce your products and services to your audience. Let us show you how you can use YouTube as a fantastic advertising platform. We will close each day with an hour for your questions. We believe, because our groups are small, you can be sure that your questions will be answered. We are offering this seminar for this amazing price only until the end of December 2013. If you are interested check out our Event Calendar to find which weekend is best for you. The location of the seminar will be our consultation location in Downtown Vancouver. This entry was posted in Events and Seminars and tagged 2013, advertisement, b2b, blogging, class, discounted seminar, discounted seminar for small business, discounted seminar for startups, event, eventbrite, Facebook, google, google adwords, google plus, internet marketing, keywords, linkedin, online advertisement, online marketing, seminar, social media management, social media marketing, social-media, startup, tags, teccrab, twitter, video production, youtube.